Readers may be aware that a digest of select articles upto 100th edition titled PreSense100 was launched in June 2015. 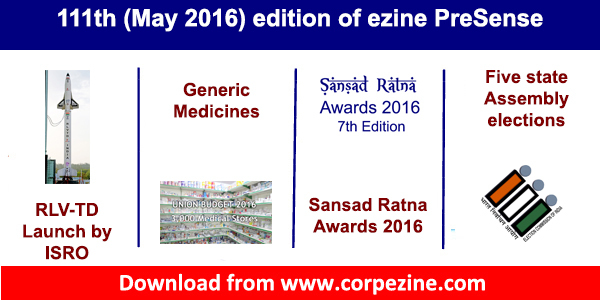 The second edition of the Digest including more articles up to 110th edition was launched on 11th June 2016 during Sansad Ratna 2016 Award function. The book titled 'PreSense100+' was launched by Dr Bhaskar Ramamurthy, Director of IIT Madras. The first copy was received by Dr C Rangarajan (Former Governor of Reserve Bank of India and Governor of Andhra Pradesh). The eMagazine (ezine) PreSense is published by Prime Point Foundation. The soft copy may be downloaded from the following link. Dr P Ganesan (Chairman, Sony Fireworks P Ltd and AAA College of Engineering and Technology, Sivakasi) has sponsored the printing of this second edition. 1) Your ezine PreSense has been honouring the outstanding Parliamentarians since 2009, based on various parameters. 7th edition of Sansad Ratna Awards 2016 is being held at IIT Madras on 11th June 2016. We bring out a brief background note on the Award Scheme and the link for registration. We are also happy to inform our readers that the second edition (both hard copy and soft copy) of the digest of select articles from the first edition to 110th edition will be launched during the Sansad Ratna Awards function. This second edition is titled PreSense100+. 2) Editorial: Susan Koshy, Editor writes on the successful launch of RLV-TD (Reusable Launch Vehicle - Technology Demonstration) by ISRO. ISRO has made every Indian proud. 3) Cover Story: Prof. R Jagannathan, Editorial Advisor brings out the salient features of RLV-TD in a simple and understandable manner. 3. Special Story : Sukruti Vadula Narayanan, Editorial Team writes on the the unknown facts about Generic medicines. 4. Politics : T N Ashok, Editorial Advisor writes on the impact of the recent Assembly elections held in five states. Besides, this ezine carries our usual Prince cartoon, interesting article from the Archives, etc. We are confident that you will continue to enjoy this edition too. Please share this ezine with your contacts. Please send us your feedback to editor@corpezine.com.